Gingersnaps Spice Supplies #110 Challenge. Gears, Cogs and Watch Bits Oh My!! Now we are talking fun with a capital F.. If you haven’t stopped into Gingersnaps you are missing some beautiful artwork, plus a great challenge. So come join us, I’m sure you will be “Geared Up”, in no time. Oh my goodness I love this piece of art. OMG Vada this is absolutely amazing!! Vada! Wow...what a fabulous piece! WOW , Fabulous art, I Love your steampunk. 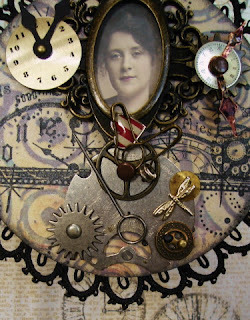 wonderful interpretation of gears for the Gingersnap Creations steampunk challenge! Oh, Oh, Oh!! Vada, you have created a amazing work of steampunk art! Love how you added that perfect little pretty touch with the framing! Love this! Vada! It's just stunning! Thanks for joining us at Gingersnap Creations! WOW is the only word to put to this piece. Beautiful piece. How large is it? What a totally brilliant card, LOVE IT!!! Wow, that's breathtaking, really wonderful. This is so beautiful! It just draws you in! Just lovely work! 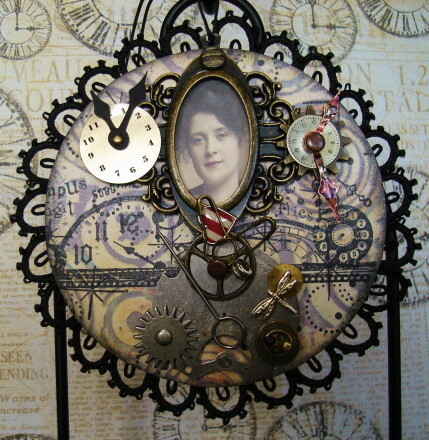 Congratulations on this piece being chosen as a Ginger Gem at Gingersnap Creations, Vada!